What restless spirits roam the corridors and rooms of your Museum once darkness falls…? Over hundreds of years, we must have gathered a ghost or two along the way. We know from very recent experience that our spectral residents are active and abroad. 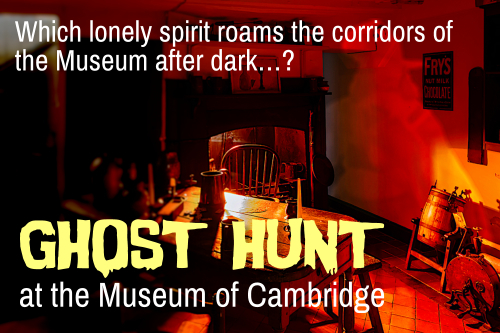 Join us and our friends from Ghost Hunt UK for a night of paranormal investigation and experience the Museum of Cambridge in a new and very different way. The evening will include a group vigil in as well as a opportunity to explore the unique atmosphere of our building on your own. The Ghost Hunt team will bring a variety of equipment for you to use in your investigations, including K2 electromotive force meters, dowsing rods, a spirit box and a Ghost Ark. There will be a chance to communicate with our etherial inhabitants through glass work, table tipping and a spirit board. You can find out more about some of the supernatural happenings at our Museum from our blog.